Ashwin Vasavada, of NASA's Jet Propulsion Laboratory, has succeeded John Grotzinger as the Curiosity rover mission's chief scientist. The science team on NASA's Mars rover Curiosity mission has a new leader. Ashwin Vasavada, of NASA's Jet Propulsion Laboratory in Pasadena, California, has succeeded John Grotzinger as Curiosity project scientist, agency officials announced Monday (Jan. 5). "John Grotzinger put his heart and soul into Curiosity for seven years, leaving a legacy of success and scientific achievement," Vasavada said in a statement. "Now I look forward to continuing our expedition to Mars' ancient past, with a healthy rover and a dedicated and passionate international team. And yes, this is all just incredibly cool." Curiosity's science team numbers nearly 500 people all over the world, who plan out how best to use the rover's 10 instruments and analyze its data. The project scientist oversees this effort and also coordinates with Curiosity's engineering team to make sure the science work doesn't put any undue strain on the rover or endanger its safety. Curiosity landed inside Mars' Gale Crater in August 2012 on a mission to determine if the Red Planet could ever have supported microbial life. The rover has already found strong evidence that a potentially habitable lake-and-stream system once covered much of the crater billions of years ago, and it's now exploring the foothills of the 3.4-mile-high (5.5 kilometers) Mount Sharp in search of more clues about the planet's past. Vasavada had served as deputy project scientist on the mission since 2004. Grotzinger, who is based at the California Institute of Technology in Pasadena, recently became chair of the university's Division of Geological and Planetary Sciences. 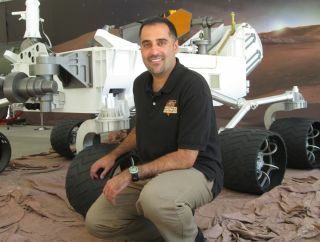 He is still a member of the Curiosity science team, NASA officials said.